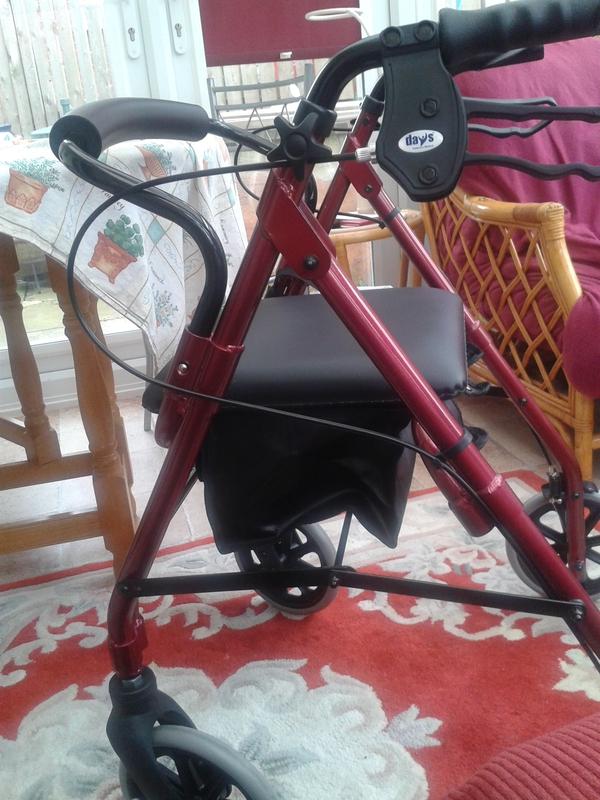 A couple of weeks ago I was give a new kind of walking frame to try. It’s different to the others that I’ve had because it’s designed to go in front of you rather than behind. My physio has been encouraging me to try one for a while but I kept putting it off for ages because I was nervous about it. However, my current Nimbo walking frame that I use is getting old so I decided to give it a go so that we would know once and for all if it was a suitable type of frame for me to have. I very quickly realised that I couldn’t operate the breaks properly because my hands aren’t strong enough. I could put them on practically so that I could slow the wheels down but I couldn’t lock them off so that they didn’t move at all. That was when I knew that this wasn’t suitable for me. Then I also realised that I couldn’t lift it up easily, which I might have to do to get up and down a kerb when crossing a road. Nonetheless, I’m pleased that I can say I faced my nerves and gave it a go. It might not be right, but at least I can say that for certain now. Good for you on giving it a try! It sounds like it’s not a good fit, but maybe there will be another style that will work. What is the reasoning behind your physic suggesting the front frame instead of a pull-behind? Um I think it’s mostly because they don’t often give pull behind frames to adults here. That and the walker I tried is cheaper for them to buy than the one I use at the moment. That makes sense. I guess I haven’t really seen the pull behind types for adults here in the US either (though I am still new to all of this!). I hope you find something you are comfortable with. Thanks. I’ve never really thought about about tennis balls. I’m hoping they’ll just let me have another of the ones I’ve got. I used to use a kaye walker but then I switched to a nimbo frame because they are cheaper and I don’t notice any difference between that and the kaye walker. I saw my consultant the other day and I’m sticking with the nimbo.